The landing craft, tank (or tank landing craft) was an amphibious assault craft for landing tanks on beachheads. They were initially developed by the British Royal Navy and later by the United States Navy during World War II in a series of versions. Initially known as the "tank landing craft" (TLC) by the British, they later adopted the U.S. nomenclature "landing craft, tank" (LCT). The United States continued to build LCTs post-war, and used them under different designations in the Korean and Vietnam Wars. In 1926, the first motor landing craft (MLC1) was built by the Royal Navy. It weighed 16 tons, with a draught of 6 feet 6 inches (1.98 m), and was capable of about 6 knots (11 km/h; 6.9 mph). It was later developed into the landing craft mechanised. The first LCT Mark 1 was launched by Hawthorn Leslie in November 1940. The LCT Mark 2 was longer and wider than the Mark 1, with three Paxman diesel or Napier Lion petrol engines replaced the Hall-Scotts. At 2,700 nautical miles (5,000 km; 3,100 mi), it had three times the range of its predecessor. Seventy-three Mk.2s were built. With a length of 192 feet (59 m), the Mark 3 was 32-foot (9.8 m) longer than the Mark 2. Even with this extra weight, the vessel was slightly faster than the Mark 1. Two hundred and thirty-five Mk.3s were built. The Mark 4 had a much wider beam (38 ft 9 in (11.81 m)) than the Mark 3. Built for use in the English Channel, it had a displacement of 586 tons and was powered by two 460 hp Paxman diesels. With a capacity of 350 tons, it could carry nine M4 Sherman or six Churchill tanks. Eight hundred and sixty-five Mk.4s were built, the largest LCT production in British yards. Testing during the Dieppe Raid in 1942 revealed a lack of maneuverability, so further versions were shorter in length. After World War II, eleven were used in 1950-1960 by the Polish Navy amphibious forces, with BDS, later ODS prefixes..
Nine hundred and sixty Mk.6s were built. One hundred and sixty Mk.5 and Mk.6 LCTs were lend-leased to the Royal Navy, and a small number to the Soviet Union. The Mark 7 was an even larger LCT that could carry troops. In 1944, when the Mk.7 design reached a length of 203 feet, its designation was changed to landing ship medium (LSM). The new variant could attain speeds of up to 12 knots and saw useage in the Pacific. 558 were built. The 225-foot LCT Mark 8, intended for service in the Pacific, was developed by the British in 1944. One hundred and eighty-six Mk.8s were ordered; however, when the war ended, most were cancelled and scrapped, or sold directly into civilian service. Only 31 entered service with the Royal Navy. Twelve were later transferred to the British Army; these were initially operated by the Royal Army Service Corps, then by the Royal Corps of Transport. Between 1958 and 1966, the other 19 ships were transferred to foreign navies or civilian companies, converted for other uses, or otherwise disposed of. An even larger LCT Mark 9 was considered in 1944, but the design was never finalized and no examples were built. The LCTs had a variety of weapons, with the British 2-pounder pom-pom mounts being gradually replaced by the faster firing 20 mm Oerlikon. The 40 mm Bofors was also widely used, and proved that the LCT was an excellent gunfire support vessel. Several special purpose versions were created for use during the Normandy landings. The British created the Landing craft tank (rocket) (LCT(R)) modified to fire salvoes of three-inch RP-3 rockets, while the landing craft guns (large) (LCG(L)) was armed with two QF 4.7 inch guns, eight Oerlikon 20 mm AA guns and two 2-pounder pom-poms. These ships did not beach; their mission was close-in gunfire support. The landing craft tank (armored) (LCT(A)) was designed for use by the first wave and was equipped with additional armour protection for the crew stations and on the bows, while a heavy wooden ramp allowed the two forward tanks to fire forward. These were all U.S-built LCT Mk.5s, which had been lend-leased to the British for Mediterranean operations, then "reverse lend-leased" back to the U.S. for the invasion. The landing craft tank (self-propelled) (LCT(SP)) carried self-propelled guns for fire support; in U.S. vessels these were 155 mm, while the British used M7 105 mm self-propelled guns and called them landing craft tank (high explosive) (LCT(HE)). A related variant was the British landing craft tank (concrete buster) (LCT(CB)), which carried three British Sherman Firefly tanks fitted with the 17-pounder high velocity gun, specifically deployed to attack fortifications. Other variants included the landing craft tank (hospital) (LCT(H)) for casualty evacuation, and one LCT served as a floating bakery at Normandy. Some LCTs with specialized weaponry were used as floating anti-aircraft batteries. These were often manned by mixed army and navy crews. Others were modified after the war for uses such as dredging. USS LCT-749 launched from on board USS LST-767, off Okinawa on 3 April 1945. The LCT had been put aboard the LST at Pearl Harbor on 10 December 1944. 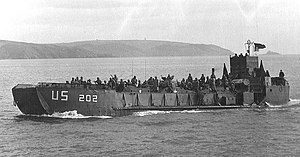 Unlike most wartime landing craft the LCT remained in active duty with the U.S. Navy after the war, and many LCTs were also loaned or given to the post-war navies of Allied countries. 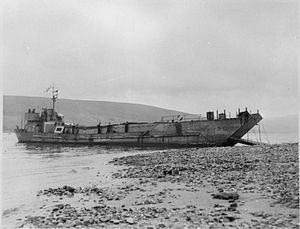 In late 1949, their designation was changed to landing ship utility (LSU), and changed again on 15 April 1952 to landing craft utility (LCU). New landing craft (the LCU 1610-, 1627- and 1646-classes) were also built to a modified Mark 5 design. Some were later reclassified during the Vietnam War as harbor utility crafts (YFUs) as they no longer served in an amphibious assault role, but were used in harbor support roles such as transporting goods from supply ships. In 1964, NASA converted an LCT Mk.5 for astronaut recovery training as MV Retriever. Current tanks are mostly transported via Airlift or National Defense Reserve Fleet freighters (during the Persian Gulf War) over long distances, but can be delivered by Landing Craft Air Cushion. As of August 2007, at least one wartime LCT is still in use, the Mark 5 LCT-203, now renamed Outer Island, and operating on Lake Superior, working as a dredge and construction barge. The British Mark 3 LCT 7074 served in Normandy and was decommissioned in 1948, and presented to the Master Mariners' Club of Liverpool to be used as their club ship and renamed Landfall. Later converted into a floating nightclub, in the late 1990s the vessel was acquired by the Warship Preservation Trust and was moored at Birkenhead. In January 2006, the Trust went into liquidation and the ship was left to rot, and by April 2010 had sunk at her berth. The craft was refloated in East Float on 16 October 2014 and moved to Portsmouth for renovation. ^ a b c d e f g "The Evolution Of the Landing Craft Tank". World War II Landing Craft Tanks. Archived from the original on 1 June 2013. Retrieved 16 January 2011. ^ a b c d e f g h i j k l m n Hearde, Basil. "The Tin Armada: Saga of the LCT". World War II Landing Craft Tanks. Archived from the original on 2 September 2011. Retrieved 15 January 2011. ^ "Landing Craft, Tank (LCT)". Global Security.org. Retrieved 17 January 2011. ^ "Landing Craft Guns (Large) Index". Navsource Naval History. Retrieved 16 January 2011. ^ a b "LCT(A)s at Normandy on D-day". World War II Landing Craft Tanks. Retrieved 16 January 2011. ^ Friedman, Norman (2002). U.S. Amphibious Ships and Craft: An Illustrated Design History. Annapolis, Maryland: Naval Institute Press. p. 246. ISBN 978-1-55750-250-6. Retrieved 17 January 2011 – via Google books. ^ Seigle, Greg (February 23, 2011). "Gulf War 20th: Logistics Marvels Made the "Left Hook" Work". Defense Media Network. ^ "LCT-203". World War II Landing Craft Tanks. Retrieved 16 January 2011. ^ "CSI: UWSP Archives? History Detectives in Action..." University of Wisconsin-Stevens Point University Library. 2004. Retrieved 16 January 2011. ^ "INS Af Al Pi Chen". Historic Naval Ships Association. 10 May 2014. ^ "Landfall". National Register of Historic Vessels. Retrieved 17 January 2011. ^ Elson, Peter (15 October 2014). "D-Day landing craft to be raised from Wirral dock". Liverpool Echo. Trinity Mirror Merseyside. Retrieved 16 October 2014. ^ Kennedy, Maev (15 October 2014). "D-day tank carrier Landfall refloated for restoration". The Guardian. Guardian News and Media Limited. Retrieved 16 October 2014. Wikimedia Commons has media related to Landing Craft Tank. This page was last edited on 5 February 2019, at 05:07 (UTC).